Groovy Grey Lynn Learners: Another turtle report. Turtles are reptiles that can live on land and in the water. A turtle can live up to 24 years old. The big sea turtles can live over 100 years old. A turtle carries it’s house on it’s back. The turtles shell is like our finger nails, it sheds once a year. They have hexagon shapes on their back and have patterns on their tummy. It has to be in warm water or it will go into hibernation. Turtles have excellent eyesight. They will mostly see you before you see them. Turtles do not have ears they sense underwater what is moving. Instead of ears the turtles can feel vibrations. As they grow older they become omnivores. Turtles eat insects, worms and some types of fish. Most sea turtles are dying because they are getting caught in fishing nets. 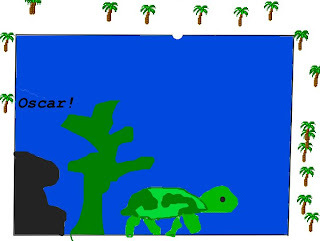 I like your turtle report. It was really interesting. I liked how you told us how long they could live. I wonder what would eat a turtle? From Matt and Jennifer in Room 10. I like you talked about Oscar the Turtle. The turtle is a really cool animal. I like them because they can go in water and on land. That was a great recount. Thanks for the information about turtles. I never knew that turtles could live up to 24 years. From Max in Room 10.